Fear of horses can be debilitating and will rob you of the joy you could be experiencing in the saddle. Heidi McLaughlin understands that fear because she once was a fearful rider. Her first experience in the saddle at eight years old was anything but wonderful when her grandmother’s barn sour horse ran away with her and scared her half to death. While her passion was still there, the terrifying experience left her with a paralyzing fear of horses that she loved so much; a fear that would take more than half her lifetime to overcome. This is why Heidi has developed the Personalized Coaching Sessions. One-on-one guidance and motivation from Heidi McLaughlin, who has been in your shoes. Confidential phone calls designed to help you overcome your fear of horses from the privacy of your own home. Opportunity to discuss your fears and what led up to becoming a fearful rider. Receive inspiration to continue and not give up. Discover areas you are “stuck” in fear and how you can tap “into your courage” to begin the journey to becoming a fearless rider. Receive simple-to-follow action steps that can be implement after each Coaching Session. "My name is Elaine Anderson. Here is a picture of me in July 2014 on my "Independence Trail Ride", one year after I met you and read your book! 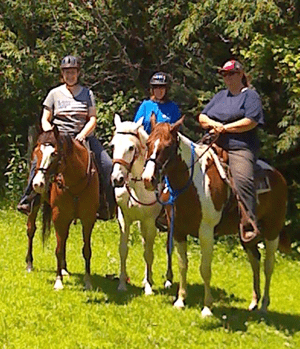 (I'm on the far left) Thank you for your inspiration and help getting me back in the saddle!" This plan give students the freedom to pay-as-you-go and is perfect for those interested in participating in one – three Coaching calls. Weekly personalized action plan to overcome fear of horses. 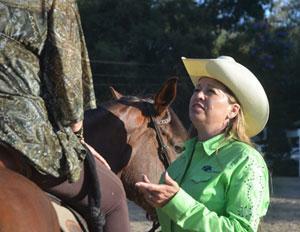 Heidi will set up an action plan each week designed to help you overcome your fear of horses. Motivation and accountability. Heidi will help you stay motivated and on track.